A Photoshop tutorial about replacing a sky in a landscape scene is bound to provoke the odd negative reaction. After all, the purist would argue, isn’t it just cheating? Surely it’s better to capture everything in-camera? Isn’t the challenge being in the beautiful spot at the perfect moment, and the thrill when something magical happens? Besides, there’s a challenge of a different kind in successfully matching two images together for a seamless, believable whole. Two random photos of land and sky won’t necessarily work, as the lighting, colours and camera angle need to be fairly consistent in both frames. 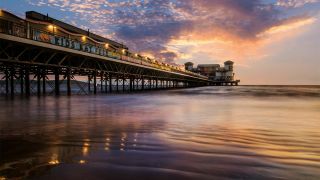 For example, the pier and sky images here were both taken with the camera facing into the sun at sunset, which helps to make the blend more natural. This is a good project for those who want to further their Photoshop skills, as it introduces many key techniques you need to master if you want to blend two or more images together. We’ll begin by using selections and layer masks to combine our images, then finish off with a neat trick for creating a subtle reflection of the sky in the wet sand. Before you begin, download the images below by clicking on the top-right-hand corner of each and saving to your computer as usual. When selecting a sky sometimes there will be parts of it that show through the gaps in the foreground, like underneath the pier here. Selecting these areas by hand can be a pain, so instead try using the Magic Wand tool. In the tool options, uncheck Contiguous. This means the tool will expand its search for similar pixels to include the entire image, not just the area you first click over. Hold Shift and continue clicking until all the gaps are selected. Then switch to the Quick Selection tool, hold Alt, and paint over any parts of the selection you don’t want to include. Open the two images in Photoshop Elements and go to the pier image. Grab the Quick Selection tool and paint over the sky, then zoom in close to check the edges. Hold Alt and paint to subtract from the selection in any places where it has gone wrong. Go to Select>Refine Edge. This lets us improve the selection. First increase Radius to about 5, then zoom in close and paint over any details that have been missed out, like the railings around the building here. Once done, set Output to: Layer Mask and hit OK.
Go to the Layers panel and highlight the layer mask thumbnail attached to the layer, then hit Cmd/Ctrl+I to invert it. Next go to the sunset image. Grab the Move tool, then drag the sunset up to the tab of the other image and down into its window to copy over. When blending two images, finish off with a tonal or colour adjustment over everything to help it gel together. Go to the Layers panel and drag the sunset layer below the pier layer so that the sky sits behind the cut-out shape of the land. Use the Move tool to reposition the layer until it looks right. If you need to resize or rotate it, hit Cmd/Ctrl+T to transform. Highlight the sky layer, hit Cmd/Ctrl+J to duplicate, and drag the duplicate to the top of the stack. Go to Image>Rotate>Flip Layer Vertical, then Filter>Blur>Gaussian Blur, set Radius 30 and hit OK. Change the layer blending mode from Normal to Overlay. Lower the layer opacity to 50%. Hold Alt and click the Add Layer Mask icon in the Layers panel to add a full black mask that hides the layer, then grab the Brush tool, set colour to white and paint using a soft-edged brush tip to reveal the reflection over the water.